These instruments are designed to operate autonomously and continuously, although the WFC acquires data only under daylight conditions. Science Data are downlinked using an X-band transmitter system which is part of the payload. The physical layout of the payload is shown below, with key instrument characteristics listed in the following table. CALIOP is a two-wavelength polarization-sensitive lidar that provides high-resolution vertical profiles of aerosols and clouds. Examples of this measurement capability can be found at the LITE and ICESAT homepages. CALIOP utilizes three receiver channels: one measuring the 1064 nm backscatter intensity and two channels measuring orthogonally polarized components of the 532 nm backscattered signal. Dual 14-bit digitizers on each channel provide an effective 22-bit dynamic range. The receiver telescope is 1 meter in diameter. 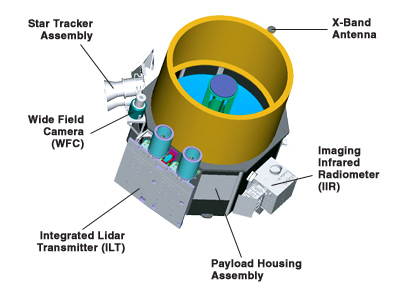 A redundant laser transmitter is included in the payload. An active boresight system is employed to maintain co-alignment between the transmitter and the receiver. Ball Aerospace Corporation, developed the instrument. The WFC is a modified version of the commercial off-the-shelf Ball Aerosopace CT-633 star tracker camera. It is a fixed, nadir-viewing imager with a single spectral channel covering the 620-670 nm region, selected to match band 1 of the MODIS (MODerate resolution Imaging Spectroradiometer) instrument on Aqua. A three-channel IIR is provided by CNES with algorithm development performed by the Institute Pierre Simon Laplace (IPSL) in Paris. The IIR a nadir-viewing, non-scanning imager having a 64 km by 64 km swath with a pixel size of 1 km. The CALIOP beam is nominally aligned with the center of the IIR image. The instrument uses a single microbolometer detecter array, with a rotating filter wheel providing measurements at three channels in the thermal infrared window region at 8.7 mm, 10.5 mm, and 12.0 mm. These wavelengths were selected to optimize joint CALIOP/IIR retrievals of cirrus cloud emissivity and particle size.